Vélo Vogue: let freedom ring! 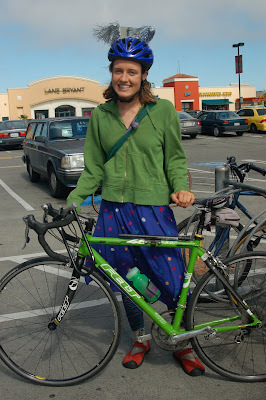 She and her friends were buying provisions for a July 4th barbecue or picnic, as we Americans are prone to do on Independence Day, at the Potrero Hill Safeway. I get the feeling that there are more and more cyclists on the roads and bikelanes these days in SF. I'm not sure if it's just because it's summer, or because gas prices are at nearly $5 per gallon, or if it's just because riding a bike is the most patriotic mode of transportation if you love this country and want to keep it beautiful. Riding around on July 4th reminded me that cycling is synonymous with life, liberty and the pursuit of happiness. 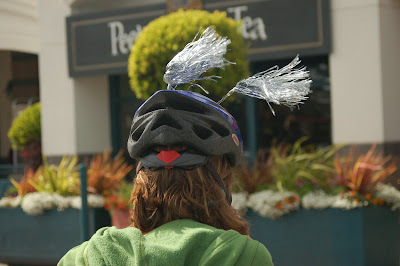 So I applaud Erin's way to celebrate independence by showing off your red, white and blue (and green) on her bicycle, with silver antennas reminiscent of fireworks on top of her helmet.